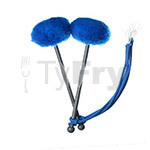 myTyFry® Ultimate Custom is the world’s first fully customisable-at-shopping cart tenor drum mallet. Featuring the same characteristic ultimate tone, ultimate clarity and ultimate projection as the TyFry® Ultimate, myTyFry® Ultimate Custom allows you to build a tenor drum mallet to your own specifications. 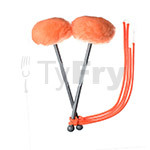 Select your choice of synthetic fur head, injection moulded high strength shaft and high quality flourish cords from the drop-down menu to create your own myTyFry® Ultimate Custom tenor drum mallets. With 2,160 possible combinations, the power is in your hands to create a custom tenor drum mallet that truly belongs to you. Visit the myTyFry® Design Studio to create and share your own custom Ultimate tenor drum mallet before ordering on our shopping cart. 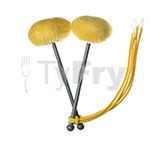 Each pair of myTyFry® Ultimate Custom tenor drum mallets is handmade to order subject to demand. Please allow 6 to 10 weeks for production and delivery following payment. The myTyFry Ultimate Custom tenor drum mallet heralds a new dawn for pipe band tenor drumming. The Ultimate is the world’s lightest, most aerodynamic tenor drum mallet and features groundbreaking permaTONE™ head technology designed to produce improved response and control with less effort. Built around a pink injection moulded high strength shaft, the myTyFry Ultimate Custom is finished with pink synthetic fur covered integrated heads and supplied with high quality hot pink colour-coded flourish cords. The myTyFry Ultimate Custom tenor drum mallet heralds a new dawn for pipe band tenor drumming. The Ultimate is the world’s lightest, most aerodynamic tenor drum mallet and features groundbreaking permaTONE™ head technology designed to produce improved response and control with less effort. Built around a pink injection moulded high strength shaft, the myTyFry Ultimate Custom is finished with white synthetic fur covered integrated heads and supplied with high quality hot pink colour-coded flourish cords. The myTyFry Ultimate Custom tenor drum mallet heralds a new dawn for pipe band tenor drumming. The Ultimate is the world’s lightest, most aerodynamic tenor drum mallet and features groundbreaking permaTONE™ head technology designed to produce improved response and control with less effort. Built around a graphite injection moulded high strength shaft, the myTyFry Ultimate Custom is finished with electric blue synthetic fur covered integrated heads and supplied with high quality graphite colour-coded flourish cords. 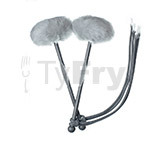 The myTyFry Ultimate Custom tenor drum mallet heralds a new dawn for pipe band tenor drumming. The Ultimate is the world’s lightest, most aerodynamic tenor drum mallet and features groundbreaking permaTONE™ head technology designed to produce improved response and control with less effort. Built around a graphite injection moulded high strength shaft, the myTyFry Ultimate Custom is finished with gold synthetic fur covered integrated heads and supplied with high quality graphite colour-coded flourish cords. 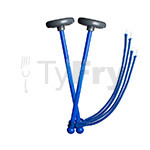 The TyFry® Ultimate tenor drum mallet heralds a new dawn for pipe band tenor drumming. The Ultimate is the world’s lightest, most aerodynamic tenor drum mallet and features groundbreaking permaTONE™ head technology designed to produce improved response and control with less effort. Built around a sleek graphite metallic injection moulded high strength shaft, the TyFry® Ultimate is finished with aqua synthetic fur covered integrated heads and supplied with high quality colour-coded flourish cords. 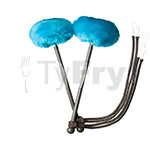 The TyFry® Ultimate tenor drum mallet heralds a new dawn for pipe band tenor drumming. The Ultimate is the world’s lightest, most aerodynamic tenor drum mallet and features groundbreaking permaTONE™ head technology designed to produce improved response and control with less effort. Built around a sleek graphite metallic injection moulded high strength shaft, the TyFry® Ultimate is finished with black synthetic fur covered integrated heads and supplied with high quality colour-coded flourish cords. The TyFry® Ultimate tenor drum mallet heralds a new dawn for pipe band tenor drumming. The Ultimate is the world’s lightest, most aerodynamic tenor drum mallet and features groundbreaking permaTONE™ head technology designed to produce improved response and control with less effort. 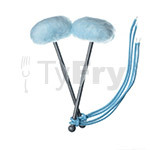 Built around a sleek graphite metallic injection moulded high strength shaft, the TyFry® Ultimate is finished with light blue synthetic fur covered integrated heads and supplied with high quality colour-coded flourish cords. The TyFry® Ultimate tenor drum mallet heralds a new dawn for pipe band tenor drumming. The Ultimate is the world’s lightest, most aerodynamic tenor drum mallet and features groundbreaking permaTONE™ head technology designed to produce improved response and control with less effort. Built around a sleek graphite metallic injection moulded high strength shaft, the TyFry® Ultimate is finished with royal blue synthetic fur covered integrated heads and supplied with high quality colour-coded flourish cords. The TyFry® Ultimate tenor drum mallet heralds a new dawn for pipe band tenor drumming. The Ultimate is the world’s lightest, most aerodynamic tenor drum mallet and features groundbreaking permaTONE™ head technology designed to produce improved response and control with less effort. Built around a sleek graphite metallic injection moulded high strength shaft, the TyFry® Ultimate is finished with emerald green synthetic fur covered integrated heads and supplied with high quality colour-coded flourish cords. The TyFry® Ultimate tenor drum mallet heralds a new dawn for pipe band tenor drumming. The Ultimate is the world’s lightest, most aerodynamic tenor drum mallet and features groundbreaking permaTONE™ head technology designed to produce improved response and control with less effort. Built around a sleek graphite metallic injection moulded high strength shaft, the TyFry® Ultimate is finished with lime green synthetic fur covered integrated heads and supplied with high quality colour-coded flourish cords. The TyFry® Ultimate tenor drum mallet heralds a new dawn for pipe band tenor drumming. The Ultimate is the world’s lightest, most aerodynamic tenor drum mallet and features groundbreaking permaTONE™ head technology designed to produce improved response and control with less effort. Built around a sleek graphite metallic injection moulded high strength shaft, the TyFry® Ultimate is finished with orange synthetic fur covered integrated heads and supplied with high quality colour-coded flourish cords. 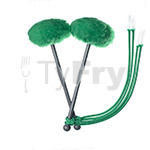 The TyFry® Ultimate tenor drum mallet heralds a new dawn for pipe band tenor drumming. The Ultimate is the world’s lightest, most aerodynamic tenor drum mallet and features groundbreaking permaTONE™ head technology designed to produce improved response and control with less effort. Built around a sleek graphite metallic injection moulded high strength shaft, the TyFry® Ultimate is finished with hot pink synthetic fur covered integrated heads and supplied with high quality colour-coded flourish cords. The TyFry® Ultimate tenor drum mallet heralds a new dawn for pipe band tenor drumming. The Ultimate is the world’s lightest, most aerodynamic tenor drum mallet and features groundbreaking permaTONE™ head technology designed to produce improved response and control with less effort. Built around a sleek graphite metallic injection moulded high strength shaft, the TyFry® Ultimate is finished with light pink synthetic fur covered integrated heads and supplied with high quality colour-coded flourish cords. The TyFry® Ultimate tenor drum mallet heralds a new dawn for pipe band tenor drumming. The Ultimate is the world’s lightest, most aerodynamic tenor drum mallet and features groundbreaking permaTONE™ head technology designed to produce improved response and control with less effort. Built around a sleek graphite metallic injection moulded high strength shaft, the TyFry® Ultimate is finished with purple synthetic fur covered integrated heads and supplied with high quality colour-coded flourish cords. The TyFry® Ultimate tenor drum mallet heralds a new dawn for pipe band tenor drumming. The Ultimate is the world’s lightest, most aerodynamic tenor drum mallet and features groundbreaking permaTONE™ head technology designed to produce improved response and control with less effort. Built around a sleek graphite metallic injection moulded high strength shaft, the TyFry® Ultimate is finished with red synthetic fur covered integrated heads and supplied with high quality colour-coded flourish cords. The TyFry® Ultimate tenor drum mallet heralds a new dawn for pipe band tenor drumming. The Ultimate is the world’s lightest, most aerodynamic tenor drum mallet and features groundbreaking permaTONE™ head technology designed to produce improved response and control with less effort. Built around a sleek graphite metallic injection moulded high strength shaft, the TyFry® Ultimate is finished with silver synthetic fur covered integrated heads and supplied with high quality colour-coded flourish cords. The TyFry® Ultimate tenor drum mallet heralds a new dawn for pipe band tenor drumming. The Ultimate is the world’s lightest, most aerodynamic tenor drum mallet and features groundbreaking permaTONE™ head technology designed to produce improved response and control with less effort. Built around a sleek graphite metallic injection moulded high strength shaft, the TyFry® Ultimate is finished with white synthetic fur covered integrated heads and supplied with high quality colour-coded flourish cords. 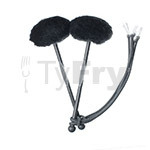 The TyFry® Ultimate tenor drum mallet heralds a new dawn for pipe band tenor drumming. The Ultimate is the world’s lightest, most aerodynamic tenor drum mallet and features groundbreaking permaTONE™ head technology designed to produce improved response and control with less effort. Built around a sleek graphite metallic injection moulded high strength shaft, the TyFry® Ultimate is finished with yellow synthetic fur covered integrated heads and supplied with high quality colour-coded flourish cords. The myTyFry® Ultimate Practice tenor drum mallet heralds a new dawn for how you perfect your pipe band tenor drumming. Built around the same pink injection moulded high strength shaft found in the myTyFry® Ultimate Custom tenor drum mallet, Ultimate Practice Custom features an enhanced head module with balance and responsiveness that makes the transition from table-top practice to tenor drum performance more seamless than ever before. myTyFry® Ultimate Practice Custom will improve every aspect of your visual and rhythmical technique. Supplied with high quality pink colour-coded flourish cords. The myTyFry® Ultimate Practice tenor drum mallet heralds a new dawn for how you perfect your pipe band tenor drumming. Built around the same baby blue injection moulded high strength shaft found in the myTyFry® Ultimate Custom tenor drum mallet, Ultimate Practice Custom features an enhanced head module with balance and responsiveness that makes the transition from table-top practice to tenor drum performance more seamless than ever before. myTyFry® Ultimate Practice Custom will improve every aspect of your visual and rhythmical technique. Supplied with high quality baby blue colour-coded flourish cords. 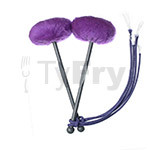 The myTyFry® Ultimate Practice tenor drum mallet heralds a new dawn for how you perfect your pipe band tenor drumming. Built around the same yellow injection moulded high strength shaft found in the myTyFry® Ultimate Custom tenor drum mallet, Ultimate Practice Custom features an enhanced head module with balance and responsiveness that makes the transition from table-top practice to tenor drum performance more seamless than ever before. myTyFry® Ultimate Practice Custom will improve every aspect of your visual and rhythmical technique. Supplied with high quality yellow colour-coded flourish cords. The myTyFry® Ultimate Practice tenor drum mallet heralds a new dawn for how you perfect your pipe band tenor drumming. Built around the same blue injection moulded high strength shaft found in the myTyFry® Ultimate Custom tenor drum mallet, Ultimate Practice Custom features an enhanced head module with balance and responsiveness that makes the transition from table-top practice to tenor drum performance more seamless than ever before. myTyFry® Ultimate Practice Custom will improve every aspect of your visual and rhythmical technique. Supplied with high quality royal blue colour-coded flourish cords. The myTyFry® Ultimate Practice tenor drum mallet heralds a new dawn for how you perfect your pipe band tenor drumming. Built around the same green injection moulded high strength shaft found in the myTyFry® Ultimate Custom tenor drum mallet, Ultimate Practice Custom features an enhanced head module with balance and responsiveness that makes the transition from table-top practice to tenor drum performance more seamless than ever before. myTyFry® Ultimate Practice Custom will improve every aspect of your visual and rhythmical technique. 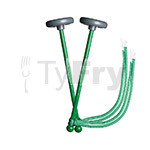 Supplied with high quality emerald green colour-coded flourish cords. The myTyFry® Ultimate Practice tenor drum mallet heralds a new dawn for how you perfect your pipe band tenor drumming. Built around the same orange injection moulded high strength shaft found in the myTyFry® Ultimate Custom tenor drum mallet, Ultimate Practice Custom features an enhanced head module with balance and responsiveness that makes the transition from table-top practice to tenor drum performance more seamless than ever before. myTyFry® Ultimate Practice Custom will improve every aspect of your visual and rhythmical technique. Supplied with high quality orange colour-coded flourish cords. The myTyFry® Ultimate Practice tenor drum mallet heralds a new dawn for how you perfect your pipe band tenor drumming. Built around the same purple injection moulded high strength shaft found in the myTyFry® Ultimate Custom tenor drum mallet, Ultimate Practice Custom features an enhanced head module with balance and responsiveness that makes the transition from table-top practice to tenor drum performance more seamless than ever before. myTyFry® Ultimate Practice Custom will improve every aspect of your visual and rhythmical technique. Supplied with high quality purple colour-coded flourish cords. The myTyFry® Ultimate Practice tenor drum mallet heralds a new dawn for how you perfect your pipe band tenor drumming. Built around the same red injection moulded high strength shaft found in the myTyFry® Ultimate Custom tenor drum mallet, Ultimate Practice Custom features an enhanced head module with balance and responsiveness that makes the transition from table-top practice to tenor drum performance more seamless than ever before. myTyFry® Ultimate Practice Custom will improve every aspect of your visual and rhythmical technique. Supplied with high quality red colour-coded flourish cords. 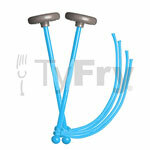 The TyFry® Ultimate Practice tenor drum mallet heralds a new dawn for how you perfect your pipe band tenor drumming. Built around the same sleek graphite metallic injection moulded high strength shaft found in the TyFry® Ultimate tenor drum mallet, Ultimate Practice features an enhanced head module with balance and responsiveness that makes the transition from table-top practice to tenor drum performance more seamless than ever before. Ultimate Practice will improve every aspect of your visual and rhythmical technique. Supplied with high quality colour-coded flourish cords.